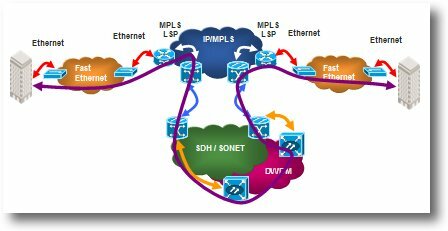 In a previous post MPLS-TE and network traffic engineering, I talked about the challenges of communication network traffic engineering and capacity planning and their relation to MPLS-TE (or MPLSTE). Interestingly, I realised that I did not mention that all of the engineering planning, design and optimisation activities that form the core of network management usually take place off-line. What I mean by this, is that a team of engineers sit down either on an ad hoc basis driven by new network or customer acquisitions or as part of an annual planning cycle to produce an upgrade or migration plan that can be used to extend their existing network to meet the needs of the additional traffic. This work does not impact live networks until the OPEX and CAPEX plans have been agreed and signed off by management teams and then implemented. A significant proportion of data that drives this activity is obtained from product marketing and/or sales teams who are supposed to know how much additional business, hence additional traffic, will be imposed on the network in the time period coved by planning activities. This long-term method of planning network growth has been used since the dawn of time and the process should put in place the checks and balances (that were thrown to the wind in the late 1990s) to ensure that neither too much nor too little investment is made in network expansion. What is a path through the network? I’ve covered this extensively in my previous posts about MPLS’s ability to guide traffic through a complex network and force particular packet streams to follow a constraint-based and pre-determined path from network ingress to network egress. This deterministic path or tunnel enables the improved QoS management of real-time services such as Voice over IP or IPTV. Generally paths are calculated and managed off-line as part of the overall traffic engineering activity. When a new customer is signed up, their traffic requirements are determined and the most appropriate paths for the traffic superimposed on the current network topology that would best meet the customer’s needs and balance traffic distribution on the network. If new physical assets are required, then these would be provisioned and deployed as necessary. Changing network configurations dependent on the time of day, for example, there is usually a considerable difference traffic profiles between office hours, evening hours and night time. The possibility of dynamically moving traffic dependent on busy hours (Time being the new constraint) could provide significant cost benefits. Dynamic or temporary path creation based on customers’ transitory needs. Improved busy hour management through auto-rerouting of traffic. Dynamic balancing of network load to reduce congestion. Improved restoration when faults occur. To be able to undertake these tasks a carrier would need to move away from off-line Path Calculation to On-line Path Calculation and this is where IETF’s Path Computation Element (PCE) Working Group comes to the rescue. In essence, on-line PCE software acts very much along the same lines a graphics chip handles off-loaded calculations for the main CPU in a personal computer. For example, a service requires that a new path be generated through the network and that request, together with the constrained-path requirements for the path such as bandwidth, delay etc., is passed to the attached PCE computer. The PCE has a complete picture of flows and paths in the network at the precise moment derived from other Operational Support Software (OSS) programmes so it can calculate in real time the optimal path through the network that will deliver the requested path. This path is then used to automatically update router configurations and Traffic engineering database. In practice, the PCE architecture calls for each Autonomous System (AS) domain to have its own PCE and if a multi-domain path is required the affected PCEs will co-operate to calculate the required path with the requirement provided by a ‘master’ PCE. The standard supports any combination, number or location of PCEs. Path Computation of any form is not an easy and simple task by any means. Even with appropriate software, computing all the primary, back-up and services paths on a complex network will strain computing techniques to the extreme. A number of companies that provide software capable of undertaking this task were provided in the above post. The PCE will need undertake computationally intensive calculations so it is unlikely (to me) that a PCE capability would ever be embedded into a router or switch as they generally do not have the power to undertake path calculations in complex network. If path calculations are to be undertaken in a real-time environment then, unlike off-line software which can take hours for an answer to pop out, a PCE would needs to provide an acceptable solution in just a few minutes or seconds. Most MPLS routers calculate a path on the basis of a single constraint e.g. the shortest path. Calculating paths based on multiple constraints such as bandwidth, latency, cost or QoS significantly increases the computing power required to reach a solution. Routers route and have limited or partial visibility of the complete network, domain and service mix and thus are not able to undertake the holistic calculations required in a modern converged network. In a large network the Traffic engineering database (TED) can become very large creating a large computational overhead for a core router. Moving TED calculations to a dedicated PCE server could be beneficial in lowering path request response times. In a traditional IP network there may be many legacy devices that do not have an appropriate control plane thus creating visibility ‘holes’. A PCE could be used to provide alternative restorative routing of traffic in an emergency. As a PCE would have a holistic view of the network, restoration using a PCE could reduce potential knock-on effects of a reroute. One of the most interesting architecture aspects of the PCE is to address a very significant issue faced by all carriers today – multi-network support. All carriers utilise multiple layers to transport traffic – these could include IP-VPN, IP, Ethernet, TDM, MPLS, SDH and optical networks in several possible combinations. The issue is that a path computation at the highest level inevitably has a knock-on effect down the hierarchy to the physical optical layer. Today, each of these layers and protocols are generally managed, planned and optimised as separate entities so it would make sense that when a new path is calculated, its requirements are passed down the hierarchy so that knock-on effects can be better managed. The addition of a new small IP link could force the need to add an additional fibre. Clearly, providing flow though and visibility of new services to all layers and manage path computation on a multi-layer basis would be a real boon for network optimisation and cost reduction. However, let’s bear in mind that this represents a nirvana solution for planning engineers! The PCE specification is being defined to provide this across layer or multi-layer capability. Note that a PCE is not a solution aimed at use on the whole Internet – clearly this would be a step just too challenging along the lines of the whole Internet upgrading IPV-6! I will not plunge into the deep depths of the PCE architecture here, but a complete overview can be found in A Path Computation Element (PCE) Based Architecture (RFC 4655). At the highest level the PCE talks to a signalling engine that takes in requests for a new path calculation and passes any consequential requests to other PCEs that might be needed for an inter-domain path. The PCE also interacts with the Traffic Engineering Database to automatically update it if and as required (Picture source: this paper). 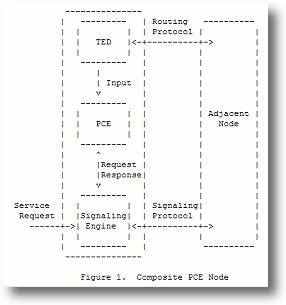 Another interesting requirement document is Path Computation Element Communication Protocol (PCECP) Requirements . It is very early days for the PCE project, but it would seem to provide one of the key elements required to enable carriers to effectively manage a fully converged Next Generation Network. However, I would imagine that the operational management in many carriers would be aghast at putting the control of even transient path computation on-line when considering the risk and the consequence to customer experience if it went wrong. Clearly PCE architecture has to be based on the use of powerful computing engines, software that can holistically monitor and calculate new paths in seconds and most importantly be a truly resilient network element. Phew! Note: One of the few commercial companies working on PCE software is Aria Networks who are based in the UK and whose CTO, Adrian Farrell, is also Chairman of the PCE Working Group. I do declare an interest as I undertook some work for Aria Networks in 2006. Addendum #3: It was interesting to come across a discussion about IMS’s Resource and Admission Control Function (RACF) which seems to define a ‘similar’ or function. The RACF includes a Policy Decision capability and a Transport Resource Control capability. A discussion can be found here starting at slide 10. Does RACF compete with PCE or could PCE be a part of RACF? This entry was posted on Tuesday, April 10th, 2007 at 14:07 pm and is filed under All, Networks, Software. You can follow any responses to this entry through the RSS 2.0 feed. You can leave a response, or trackback from your own site. Default editor in Outlook 2007 is Word? PBB-TE (PBBTE) / PBT or will it be T-MPLS (MPLS-TP)?